Most cancer deaths are due to spreading of the primary tumor to one or several secondary sites, in a process called metastasis. These metastases are often more difficult to treat than the primary tumor and their presence marks severe progression of the disease. Tumor cell metastasis involves cell migration through heterogenous microenvironments in tissues, along anatomical features such as blood vessels and nerves, and into and out of vasculature. Mounting evidence has accumulated, demonstrating that metastatic tumor cells can migrate via several modes or mechanisms of migration, and can switch between these modes depending on the specific features of the microenvironment. Our research in this area is focused on understanding how distinct physical and biochemical cues from the tumor cell's microenvironment affect the phenotype, biological signaling, mechanical properties, and interactions with other cells during metastasis. We are interested in metastasis to the brain, which is especially difficult to treat and unique given that the process requires crossing of the blood-brain barrier. Astrocytes are one type of neural cell that are in close proximity to (and/or in contact with) the brain microvasculature. We have recently shown that secreted factors by astrocytes from the brain microenvironment alter the migration, morphology, and cytoskeletal organization of metastatic breast tumor cells (see below). Check out our ﻿recent paper﻿ for more information. 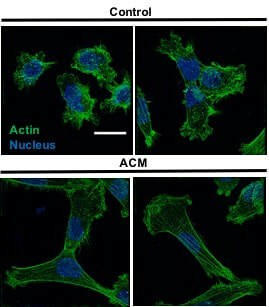 Confocal images reveal morphological and cytoskeletal alterations of MDA-MB-231 metastatic breast tumor cells in response to astrocyte conditioned media (ACM). These morphological changes are linked with increased migratory capacity.